Most accurate Hijri Calendar for many Android Devices!!! Did you know that your English (Gregorian) Age is different than your Islamic (Hijri) Age? This app has multiple features. The app calculates conversion between the Gregorian Calendar and Hijri Calendar while simultaneously calculating your age, accurately, as per the two faiths! The app also provides various features which gives further knowledge about the most beautiful mosques around the World. The historical details & the amazing aspects of the mosques are worth knowing. 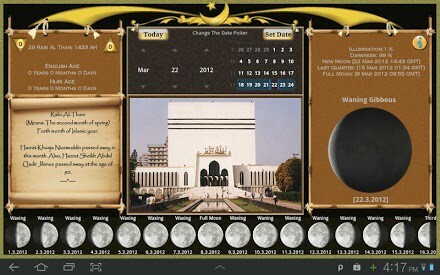 The app also provides details on specific historical events based on each Islamic calendar month. Last but not least, the app also accurately provides complete moon phases of each day. It gives the exact shape of the moon from the past, present and also possible future!! Download this free app and gain all the interesting facts that will help you to gain more positive knowledge about Islam!! We are coming up regularly with more apps and require your support and constructive comments. Keep checking back for more apps!! AGV with your support is continuously “bringing imaginations into reality” through application development and solutions. 1. Device clock to show change of day/date as the clock strikes midnight (gregorian). 2. Device clock to show change of day/date as computed by Maghrib and Fajr times. I have not seen or heard of any Hijri Calendar app that can do this…yet!